The criminal offense of "Criminal Mischief" NJSA 2C:17-3, comprises what is commonly known as vandalism – damaging or interfering with the tangible property of another. Depending on the nature of the damage, the property or the risk created, it can range in seriousness from a disorderly persons offense to an indictable crime of the second degree, which is the second most serious category of crime in New Jersey. It can also include, not just damage done on purpose, but reckless and even mere criminally negligent damage under certain circumstances. It also specifically includes graffiti and damaging or destroying rental property in retaliation for the landlord starting eviction proceedings. What if the damage was an accident? Purposely or knowingly. Damage to someone's tangible property. Recklessly or negligently. Damages someone's tangible property using explosives, fire, or other dangerous means. Purposely, knowingly or recklessly. Tampers with someone's tangible property in a way that endangers person or property. How serious is the offense? The seriousness of the offense depends on the factors described below. causing interruption, or impairment, of any public service such as communication, transportation, or supply of gas or water. Fourth Degree Crime: Punishable by 6 to 18 months in prison and up to $10,000 in fines. Disorderly Persons Offense: Punishable by up to 6 months in jail and $1,000 in fines. Graffiti - If the damaging of the property involves graffiti, the defendant may be required to pay the owner of the defaced property the cost of the damage to the property and perform community service of either a minimum of 20 days, or the number of days required to remove the graffiti. 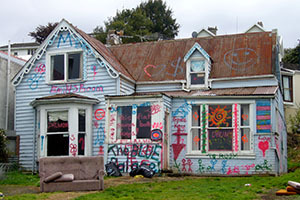 Destruction of Rental Property by Tenant - Any person convicted of criminal mischief which involves the destruction of rental premises by a tenant or former tenant in retaliation for eviction may also be required to pay the owner for the amount of damage caused. Call the team of NJ defense lawyers at LS&P Lawyers at (908) 709-0500 if you or a family member is facing such charges. The initial consultation is free.